Surveillance footage shows the moment a Cambridge, Massachusetts man was confronted by federal authorities in New York for allegedly threatening Senator John McCain and Ice and Customs Enforcement agents on social media. Brandon Ziobrowski, 33, was arrested Thursday after he allegedly Tweeted a murder-for-hire against ICE agents. "I am broke but I will scrounge and literally give $500 to anyone who kills an ICE agent. @me seriously who else can pledge get in on this let’s make this work," Ziobrowski allegedly posted to Twitter. The suspect’s Twitter account was suspended at the request of law enforcement. Brandon Ziobrowski, allegedly threatened Immigration and Customs Enforcement agents on social media; his Cambridge, Mass. neighbors didn't have much nice to say about him. 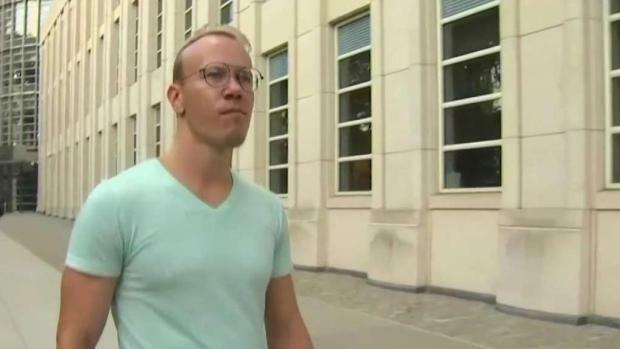 U.S. Attorney, Andrew Lelling, said in a press conference Thursday that Ziobrowski's social media accounts had threats of violence over the past several months. Such threats included his desire to "slit Senator John McCain's throat." "Under the guise of political debate, we are facing a rising tide of public threats and invitations to violence," Lelling said. Ziobrowski has no prior criminal background. His neighbors in Cambridge noticed the FBI seize several things from his apartment just weeks ago. "When freedom of speech crosses the line into threats or offers to have federal law enforcement officers killed, we will never tolerate that," Peter Fitzhugh, Homeland Security Special Agent in Charge, said. Ziobrowski was arraigned Thursday and charged with using interstate commerce to transmit a threat to injure another and he was released on a $50,000 bond with conditions. He is scheduled to be arraigned on Aug. 15 in a Boston federal court. 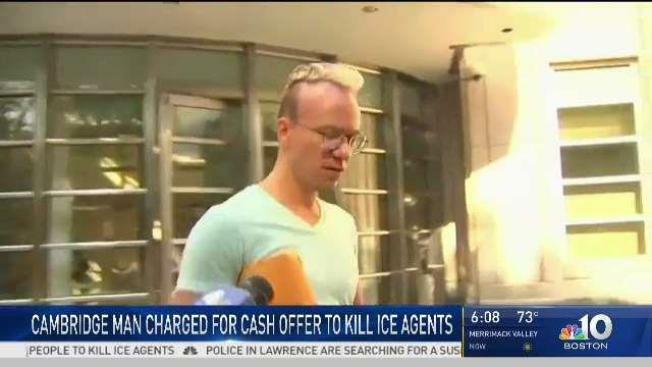 Surveillance footage shows the arrest of Brandon Ziobrowski, who allegedly threatened to "give $500 to anyone who kills an ICE agent." It was not immediately clear if Ziobrowski had an attorney.